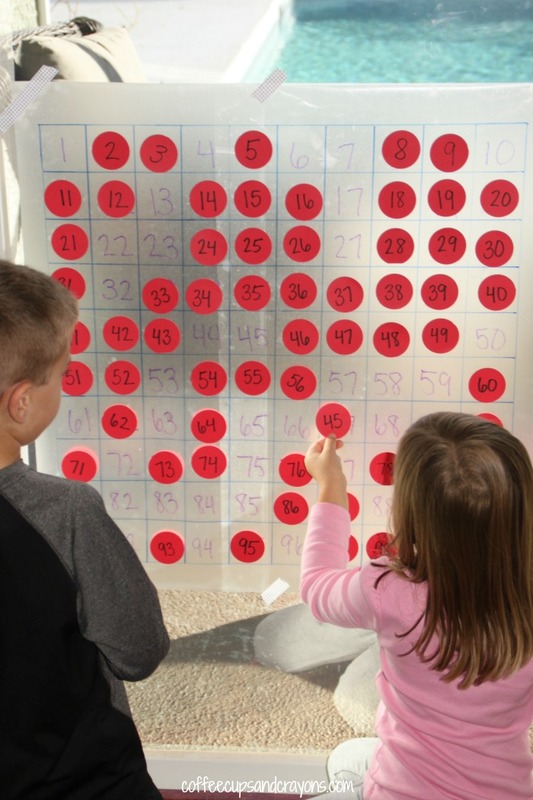 A hundreds chart is a classic math tool that can be used to teach tons of math concepts. To play with some number concepts and show my kids just how fun a hundreds chart can be I made them a big, sticky one out of contact paper! 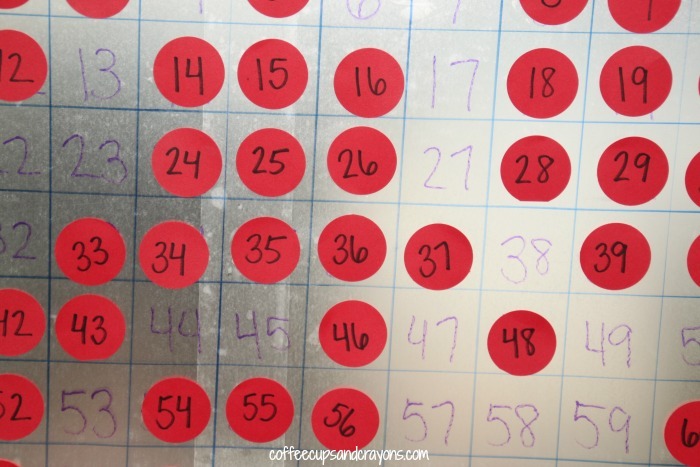 To make the sticky hundreds chart I used my hole punch to make 100 red circles and then numbered them from 1 to 100. Then we made a 10 by 10 grid on contact paper a little larger than the size of the circles. I peeled off the paper and taped the contact paper grid to our window sticky side out. Once it was up I numbered it on the sticky side with a permanent marker. I began by hiding the red numbers around the room for a math scavenger hunt, but there were so many of them! I ended up hiding about half and then putting the rest in a big pile on the floor. The kids stuck each number to the matching spot on the hundreds chart. As they did they began to see the patterns on the chart and use the tens column and the ones column to quickly find each number. My kindergartner is learning to count by 5s, 10s and 2s in school so he had fun identifying those patterns on the chart too. There are so many ways to learn and play with a hundreds chart! 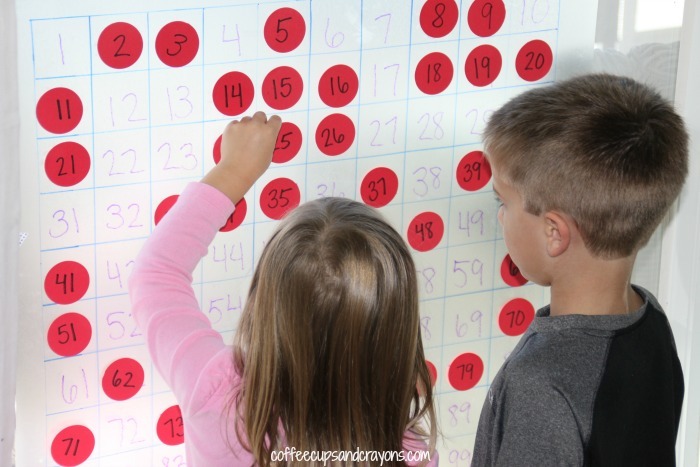 Using a sticky hundreds chart give you the chance to practice over and over and over again. I can’t wait to see what other math games we can play with it. I love this activity, Megan! What a fun way to practice so many math skills. I was planning to create this 100’s chart and wanted to make sure I understood how you did this. Did you write on the sticky side of the contact paper so that you could stick the circles onto the paper when done? Yep! That is exactly what we did! I love this activity and would like to try it! How did you make the circles? Hi Colleen! I used a 2 inch hole punch–waaaaaay easier than cutting them out! Shaunna thanks! I was surprised by just how engaged they were! I will say that it turned out to be so much better than I even thought it was going to be! I was surprised to see all of the concepts they were able to discover on their own. This is so much fun. I can see that already. It really is Playtivities thank you! They have spent so much time with it! We have a snow today, so we’re definitely doing this! Lorie they literally played with it for an HOUR straight the first day!!! You may be able to get out a book! Wonderful idea. I am adding it to my upcoming math post for 100 days of school! Thank you Natalie! I am so happy with how it went over…anything to convince everyone else that hundreds charts are cool! That is awesome that they spent so much time on it! Can’t wait to try it! What an awesome hundred’s chart activity!! I can’t wait to try this with my four year old. Thanks for the creative twist, Megan! This looks great and fun! I do have a question…. Once they stick the circles to the contact paper….can they be peeled off and used again? Love this, Megan! My five year old is fascinated by numbers. I know he’d enjoy this! For those that are ready for counting by 2’s, 5’s and 10’s you can make those circles a different color and then they will really begin to see patterns! Some circles may have to be layered to get to be 2 or 3 colors in that circumstance. What fun!! Cathy!!!!! I LOVE that idea!!!!!!!! I am totally doing it! How did you get the grid onto the contact paper?